Hybrid Camera Revolution: Studio Ring Light or Ring Light for your Rig? The F&V R-300 is Both! 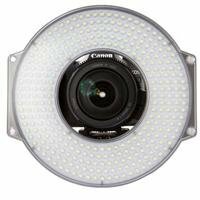 Studio Ring Light or Ring Light for your Rig? The F&V R-300 is Both! Last month at NAB, I was a "one-man band" - shooter, gaffer, interviewer, sound person, editor etc. I learned a lot about shooting events solo - enough to know that I had almost the right rig for the job. If I ever do this again, I will need the Panasonic 12-35 f2.8 lens or some other fast autofocusing, low light glass. The focus motor on the old Sigma 18-50mm f2.8 just isn't fast or accurate enough (you'll see that in the interview at the bottom of the post with F&V North America Manager Connor Hartnett). That said, my DIY rig worked well - especially the new ring light I bought for the show. That light is the $199 F&V R-300, and it is easily the best lighting investment I've made in 35 years of video and moviemaking. I love my Stellar Ring Light - but the F&V is better - because it is dimmable, has easy-to-use magnetic clip on filters for both diffusion ($25) and tungsten color balance (included) - and it is powered by one $8.50 Sony FP-V550 battery (or by 12V input from an AC adapter if you want to plug it in). The R-300 is smaller than the Diva and much more portable - both in the studio and in the field. Here it is on the front of my DIY rig, attached with the $40 F&V rail mount. As usual, if anything here has helped you to make a buying decision, please shop using the links above or the display ads below. It won't cost you anything extra, and it will keep these blog posts coming. Thanks!